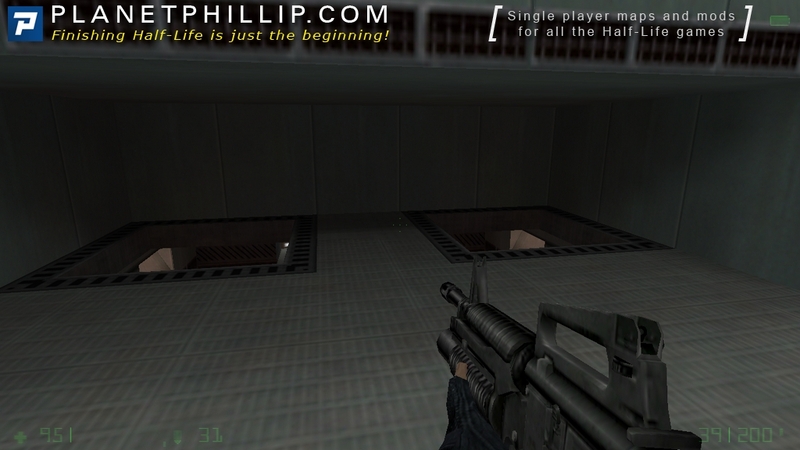 Copy underhalls.bsp into your opposing force\gearbox\maps folder. Open the console and type map underhalls. I enjoyed this very much and it made me realize how much I miss playing long HL/OP mods. This is one you will probably enjoy but it’s not very long, so don’t get too settled. I tried it but it was to damn hard. There was no option for easy. Seems like you had to shoot a black ops/ninja more than usual. There also were a lot more attacking me. I had all the weapons at my disposal but was outnumbered. When the game first started I got killed real quick,lol. When it started again,it start somewhere else. As for the map itself I played it through. It was nice playing an op4 map again. Still I woudn’t say that this map is a “play it now map”. 4 Stars from me and even that is to good for the map. So if you’re looking for some quick action then try this map. Playtime is about 5-10 minutes it depends on your skills. It’s nice to see new maps for the great OP4 (my fav HL expansion). I have changed my original recommendation because although it was fun to play, I just felt it was too small to say everybody should play it. 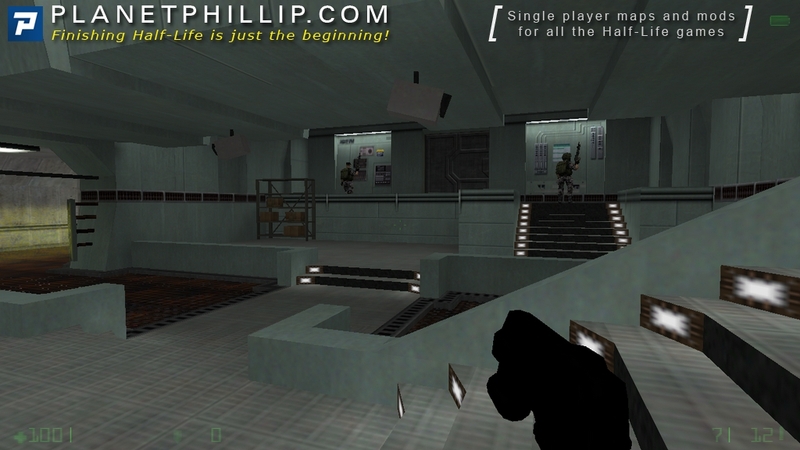 It’s a well-made remake of Underhalls for Doom 2, but you have to give credit for the layout not to the author but to the original level designers. That said, the author has made a nicely detailed remake and that deserves recognition. All in all it was fun to play but wasn’t long enough to get excited about. BTW, if you are interested, here is a playthrough of the original on YouTube. A fun little remake of the second Doom 2 map that makes some changes to the original when necessary. 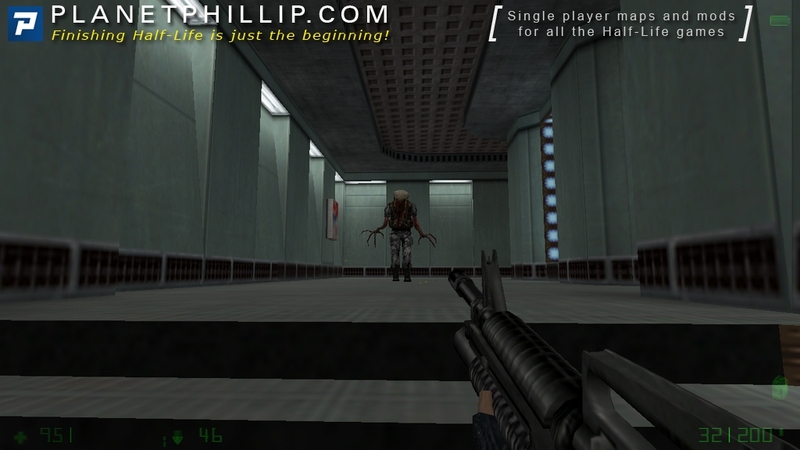 I played Doom2 long before I discovered Half-Life. While this map was short, and I didn’t find an end, it took me back to my Doom2 days. 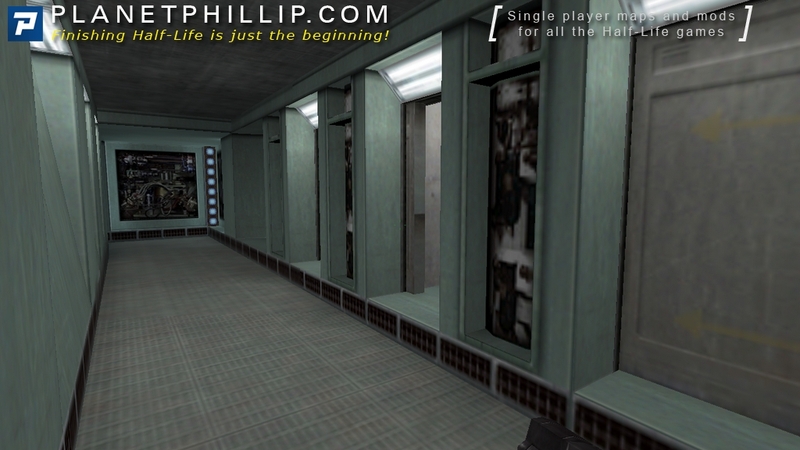 I would like to see more HL remakes of Doom levels. Not as bad as I was expecting and an amusing brief diversion! 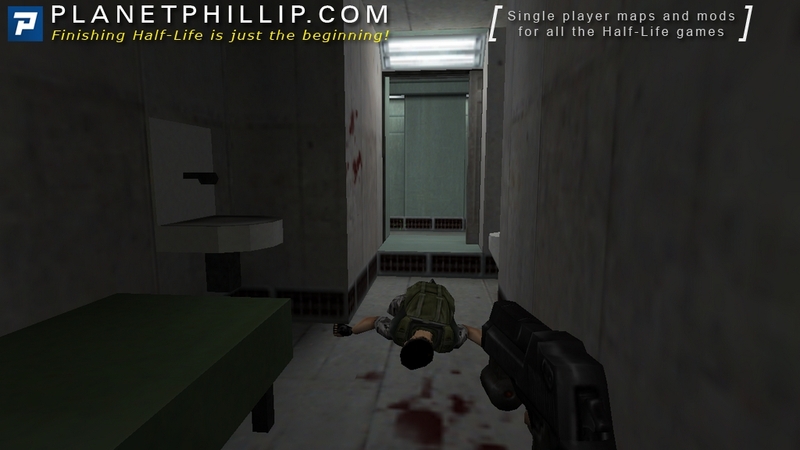 Graphically, this is to Doom 2 as HL2 is to HL1 but retains the fun of old school Doom. It is mainly running around finding switches while killing some baddies, just like Doom but in a more detailed environment. it’s not long enough to say PIN, it is however worth playing. This is a remake of Doom 2’s level 2, where we wandered through canalization. Here we start not in front of the canal, but in a prison cell, which the author added to Underhalls” layout. So there’s another nostalgia: it begins just like Wolfenstein 3d. We take vest and strong pistol, and then there’s nice view for a couple of kills in front of us. The design is very beautiful. Architecture is well detailed with nice use of one texture on multiple brushes, light textures. The setting was changed from canalization to some base or installation. There are new textures which blend in nicely. One of them reminds about Doom 3. Doom 2’s barriers replaced by cool forcefields. 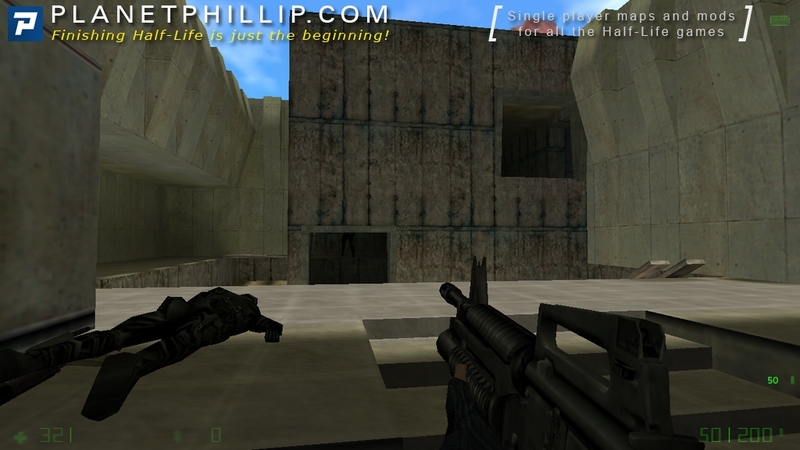 The gameplay is changed to fit Opposing Force’s standards. It is balanced well. 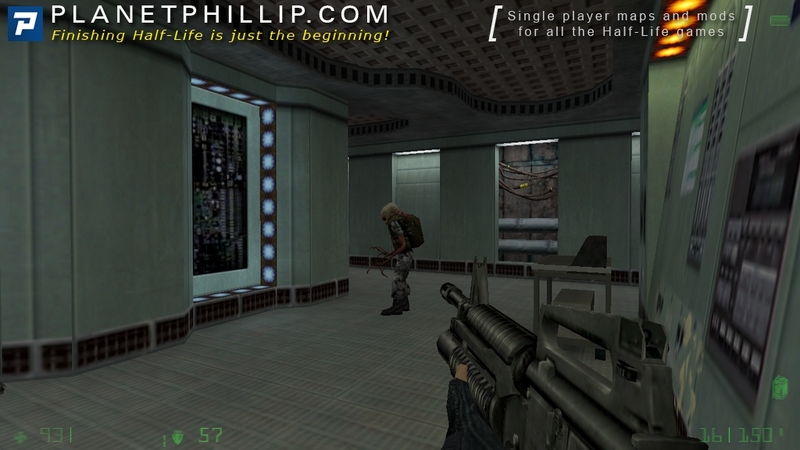 Our enemies are Half-Life’s hostile soldiers and Black Ops. Overall, it’s an excellent map with great level design, fun gameplay and nostalgic moments. 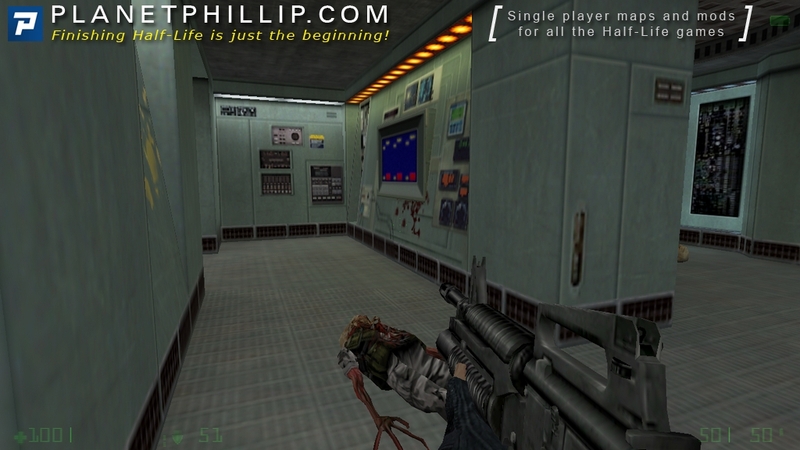 This is the perfect Play it Later, it just feels like a HL1 perfect Deathmatch map, but for a single player experience just feels kind of lame, you know, it seems the author wanted to keep continue this map downwards I guess that elevator was there for that reason, but as is only 1 map is useless. This is a short but pretty solid map that is a solid “Maybe” from me. I was kind of disappointed to find that its layout was based on an old map (I never played Doom 2 so I didn’t recognize it). But in general we have a nicely designed and fairly challenging single map. I thought the architecture and look of the map was well done. The lighting was attractive as well, and I liked the backtracking aspect of the gameplay. Things can get tough since there are a couple enemies that surprise you (one cheaply) in areas you’ve already been through. What’s missing is any kind of purpose or point to the map. I’m not saying that a single map has to have a story, but some setting of the scene would have been nice. It’s not bad but it’s certainly not a must play. I definitely played this one at the time it was posted but apparently never wrote a review. From what I recall it was a fairly well designed set of areas, but seeing as it was pretty basic and based off another map, I guess it was worth a Maybe.